Update May 2016: Probabilistic forecasting outperforms quantile grids (fourth generation of forecasting engine). Quantile Grids represent a radical improvement over classical forecasting methods whenever inventory is involved. They are also superior to quantile forecasts because they deliver much more information about the future. 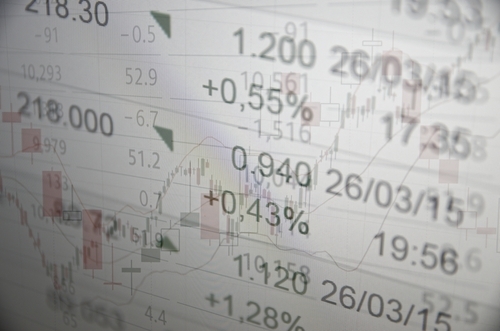 Traditional forecasting methods work poorly, especially for commerce. The root cause of this problem is simple: the future is uncertain. Classic forecasts try to predict the one correct value of future demand, and, well, they fail at it. Desperately trying to fix classic forecasts in the hope that the “correct” future demand will be predicted is delusional. Quantile grids take a completely different stance on this issue. With quantile grids, Lokad predicts not one future demand value for a given product, but the entire probability distribution for the demand; that is the probability of having a demand of zero units, then one unit, then two units, etc. This information is vastly richer and can be leveraged in ways that are exceedingly more profitable than classic forecasts. Many vendors boast about using "advanced" forecasting methods like ARIMA, Box-Jenkins and Holt-Winters which are actually close to being half a century old; they were all conceived at a time where the most powerful corporate computers had less processing power than most fridges have nowadays. The people who invented these methods were exceptionally smart, but they had to make do with the computing resources of their time and therefore gave preference to models that could be computed with very few calculations. Nowadays, we can use massive amounts of computational power for our forecasting challenges at very little cost. 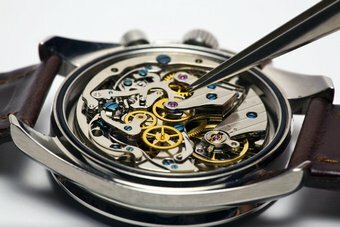 methods like ARIMA, Box-Jenkins and Holt-Winters ... were all conceived at a time where the most powerful corporate computers had less processing power than most fridges have nowadays Keep in mind that 1000 hours of computing power costs less than $50 when using a cloud computing platform. Obviously, this opens up radically new perspectives for forecasting, and it is exactly these perspectives that Lokad has been exploring extensively. Quantile Grids represent the third version of Lokad’s forecasting technology, but let’s go a few years back to get the full picture. We started with classic forecasts in 2008 as the first version of our forecasting technology, and despite three years of tremendous R&D efforts on the part of Lokad’s team, the classic approach proved to be a dead end. We never really did succeed in having any client deeply satisfied with classic forecasts. As we learned more about our clients’ experiences with other forecasting vendors, it turned out that there was not a single company that was even close to being satisfied with the forecasting technology they had acquired. This problem was not specific to Lokad, and we realized that the entire forecasting industry was dysfunctional; and we decided to do something about it. 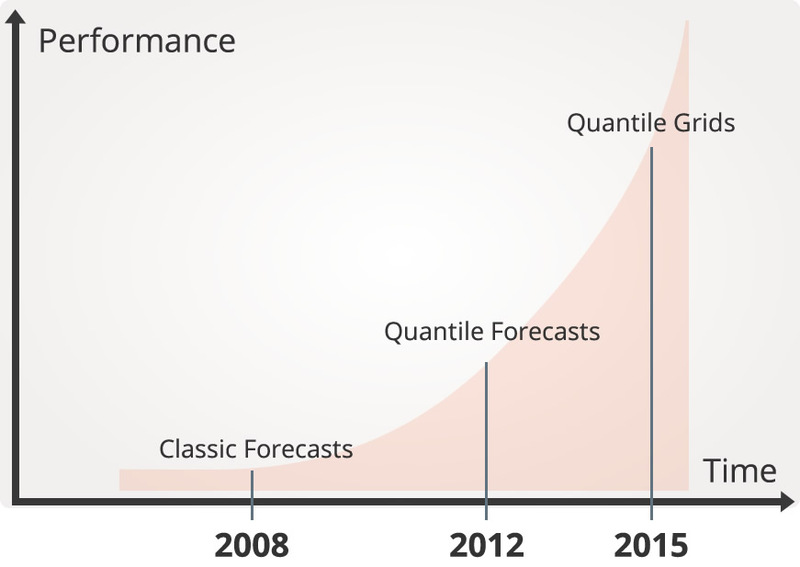 In 2012, Lokad released the second version of its forecasting technology codenamed Quantile Forecasts. Simply put, quantile forecasts address the No1 issue that plagues classic forecasts: classic forecasts simply do not look at the right problem. Indeed, the challenge for companies is to avoid two extremes: unexpectedly high demand that causes stock-outs, and unexpectedly low demand that causes dead inventory. What happens in the middle when the future demand is roughly “as expected” matters very little from the business perspective. Yet classic forecasts, mean or median forecasts, completely ignore these “extreme” situations and focus entirely on the average case. Unsurprisingly, classic forecasts fail at preventing both stock-outs and dead inventory. Quantile forecasts approach the challenge heads-on and directly look at the scenario of interest, say avoiding stock-outs, and strive to provide a precise answer to this very problem. Suddenly in 2012, we started having more and more satisfied clients. For the first time in the history of Lokad, more than 3 years after the company’s launch, we had something that worked. In 2015, Lokad released the third version of its forecasting technology, the quantile grids. While quantile forecasts were already a radical improvement over classic forecasts, they still had their weaknesses. As we gained more and more experience with dozens of deployments of our quantile forecasting technology, we realized that while the idea of producing a forecast for just “one” business scenario was sound, it was not entirely complete. Why just this one scenario? Why not a second scenario, or a third? Manually managing multiple scenarios proved tedious, and we realized that all scenarios should be forecasted at once. From a computing perspective, this was significantly more costly: for every product, we would compute the respective probabilities of (almost) every single demand level. However, while the amount of computations involved appears staggering, the prices of computing resources have also been in free fall over the years. And what we would have considered to be too costly 5 years ago, was now very much affordable. In 2015, Lokad released the third version of its forecasting technology, the quantile grids. While being extremely computationally intensive, quantile grids are now affordable thanks to the free fall drop of cloud computing resources. Future demand is uncertain. Any attempt at representing the future demand with just one value is somewhat naïve because no matter how good this value can be, it can never tell the full story. While it would be nice to have a “magic” system that was capable of predicting the exact level of future demand, this is quite delusional too. When people try to deal with a forecast that is incorrect, it is very tempting to try to “fix” this forecast. Unfortunately, statistical forecasting is majorly counter-intuitive, and the reality is that there is frequently nothing to fix: the forecasted value is one of the perfectly valid and possible outcomes for future demand. 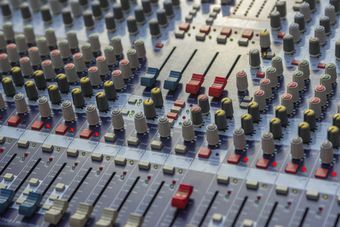 The system can potentially be fine-tuned a little to produce slightly more probable values for future demand, but that’s about it. Your company ends up getting only slightly more probable values for future demand, which does not result in a boost of business activity that would have been expected in the first place. Thinking about the future from a completely probabilistic perspective might seem complicated, but it actually represents what every business executive is already doing, albeit in less formal ways: weighing the odds of certain outcomes and hedging the bets vis-à-vis their business in order to be well-prepared when dealing with the most relevant scenarios. From the forecasting engine perspective, since we do not know in advance what the “most relevant” scenarios would be, the logical solution, albeit a somewhat brutal one, consists of processing all possible scenarios. Quantile Grids take a very different approach: for every product, Lokad calculates the respective probabilities of every single level of future demand. However, assuming that a business has one thousand products to forecast (and some of our clients have millions of SKUs to deal with), and that Lokad computes the probabilities associated with 100 scenarios for each product, the quantile grids would produce a huge listing with 100,000 entries which does not sound practical to process. We get to this point in the section below. For every purchase decision, we can write down a simple back-of-the-envelope calculation, the “outcome” formula that depends on the future demand vs the current purchase decision. Then, every single decision can be scored because based on the respective probability of every level of future demand. 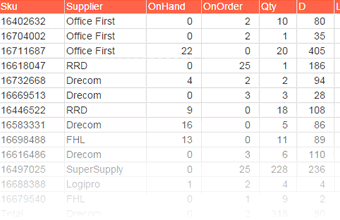 Demand forecasts are most commonly used to drive supply chain decisions such as making purchase orders for commerce or triggering a production batch in an industrial setting. Once we have all the probabilities associated with all the future outcomes, it is possible to build a complete priority list of all purchase decisions. Indeed, for every purchase decision, we can write down a simple back-of-the-envelope calculation, the “outcome” formula: assuming that demand will be D units and assuming that we purchase P units, then the financial outcome will be X. Needless to say, Lokad is here to help you write this short formula, which for most businesses boils down to the gross margin minus the cost of inventory and minus the cost of stock-outs. Consequently, once we have this formula, for every supply chain decision, like “purchase 1 unit of product Z”, the outcomes can be weighed against the probabilities of every single possible future. By doing this, we compute the “score” of every possible decision. Once every decision has been scored, it is possible to rank all these decisions, putting the most profitable options at the top of the list. We refer to this list as the **master purchase priority list**. It is a list where every product appears on numerous lines. Indeed, while purchasing 1 unit of product Z might be the top-ranked purchase decision (a.k.a. the most pressing purchase), buying the next 1 unit of product Z may only be the 20th most pressing purchase decision, with many other units of other products to be purchased in between. The master list answers a very simple question: if the company has one extra dollar to spend on its inventory, where should this dollar go first? Well, this dollar should go to the item that gives your company the maximum returns. Then, once this particular item is acquired, one can repeat the same question. However, this time, once this one extra unit has been acquired, the next most profitable item to be purchased is likely to be a different one since there are strong diminishing returns in piling up high the same item within your stock. Indeed, the more inventory you have, the less your inventory rotates and the higher your probabilities of being stuck with dead inventory. These issues are naturally reflected in the “outcome” formula, and in the resulting prioritization of the list. Figuring out the "optimal" service levels - that is - the desired probabilities of not getting a stock-out, is a very difficult exercise. This is a complex issue because service levels are only indirectly related to the financial performance of a company. In fact, for some products, obtaining one extra percent of service level can prove to be vastly expensive, and hence, if resources are readily available, they should rather be allocated on other products, where the same level of investment would yield not 1% but an extra 10% of service level. With Quantile Grids used as a master purchase priority list, one does not even need to care about service levels as these are natively reflected in the prioritization itself. If the service level of a high-margin product can be cheaply increased, this product naturally climbs up to the top of the list. Inversely, if a product is suffering from wildly erratic sales which renders all attempts at increasing the service level extremely costly, then this product will rise to the top of the list only when stocks are running dangerously low and when a company is almost guaranteed not to end up with dead inventory despite very erratic demand patterns. The priority list also solves the problem of cash constraints. No matter where your company stands as far cash is concerned, the priority list gives you a tractable option. If you have very little cash available, your company only buys what is at the very top of the list, maintaining the stock levels of only those products that desperately need to be replenished. If you have additional cash on hand, your company then has the option of increasing its inventory by focusing on items that will drive the most growth while keeping inventory risks under control. Companies must frequently deal with supply constraints such as minimum order quantities either at the SKU level or at the order level. Sometimes, units need to be gathered in large batches such as containers. Such constraints can be naturally integrated into one’s workflow processes via a master purchase priority list as described above; not only does this provide prioritized purchase suggestions, but it also provides recommendations that are compatible with one’s ordering constraints. The exact process to follow depends on the actual type of constraints a business may have. Let’s consider container shipments for example. 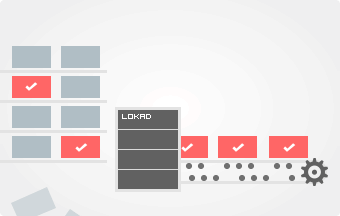 Lokad can compute the cumulative volumes per supplier, assuming that purchase lines are processed in the order of the list and assuming that each supplier is shipping independently from the other. Based on these cumulative volumes, the process of going down the list until the target container capacity is reached is very straightforward. Similarly, if a minimum order quantity constraint exists for a given SKU, in this case it is also easy to remove from the list all the lines that come before the constraint is fulfilled and to report the quantities directly to the first line once the constraint is satisfied. By forcing the purchase to be set to a minimum of N units, the competitiveness of the SKU is degraded, i.e. the SKU first appears in the list at a lower rank, which is exactly the intended behavior as inventory risks increase with minimum order quantities. In particular, this approach entirely addresses the long standing challenges that had negative consequences on both classic and quantile forecasts alike: what should be done when the suggested reorder quantities are above or below the ordering constraints? If some units need to be removed, which products should be the first to go? If units need to be added, which products should be purchased in greater quantities? Older forecasting methods did not provide satisfying answers to these questions. With a priority purchase list, one just needs to follow the order of the list.